The ViewSonic VA2265Smh is a 22" (21.5" viewable) widescreen monitor with an LED backlight and glossy, thin-bezel design ideal for use in the home or at the office. With Full HD 1920x1080 resolution, 3000:1 static contrast ratio, and SuperClear VA technology, the VA2265Smh delivers stunning brightness and contrast with amazing screen performance at nearly any viewing angle. ViewSonic's exclusive ViewMode provides intuitive presets to deliver optimized screen performance in different applications. In addition, Flicker-Free technology and a Blue Light Filter help to eliminate eye strain from extended viewing periods. Paired with versatile input options including HDMI and VGA, the VA2265Smh allows flexible connection to PC systems, laptops and other multimedia devices. As a complete multimedia package, the monitor also includes a pair of integrated speakers. A VESA-mountable design offers additional mount flexibility. 15.3" x 20.1" x 7.6"
The ViewSonic VA2265Smh is a 22” (21.5” viewable) widescreen monitor with an LED backlight and glossy, thin-bezel design ideal for both work and entertainment. With the latest ViewSonic SuperClear MVA panel technology and 3000:1 static contrast ratio, the VA2265Smh delivers stunning screen performance at nearly any viewing angle. Paired with versatile input options including future-proof HDMI and VGA, the monitor allows flexible connection to PC systems, laptops, and other entertainment devices. As a complete multimedia package, the monitor also includes a pair of integrated speakers for excellent audio performance. 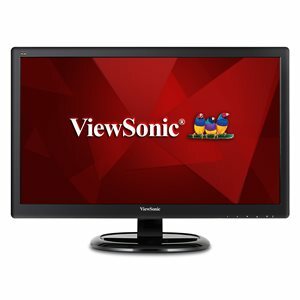 ViewSonic provides great value for the stylish, high-performance VA2265Smh monitor. SuperClear Technology delivers exceptional color performance and extends display viewing angles to 178 degrees both horizontally and vertically. Experience accurate and vivid colors with consistent levels of brightness whether looking at the screen from above, below, the front, or the side—with no color distortion or decay. HDMI is the highest, future-proof video standard, guaranteed for true digital picture and audio clarity. The HDMI interface on this monitor allows you to connect to a variety of HD devices including gaming consoles, Blu-ray players, laptop PCs, digital cameras, and many others for the ultimate true high-definition experience. This monitor features Full HD 1920 x 1080 resolution for unbelievable pixel-by-pixel image performance. You’ll experience amazing clarity and detail while working, gaming, or enjoying the latest in multimedia entertainment. An ultra-high static contrast ratio of 3000:1 offers a wider range of grayscale to show deeper, richer colors with more visible details in shadows and highlights. This monitor can display vivid and realistic images for photo editing, watching movies, or any multimedia application.